What does each visibility setting mean? What will be shared with the reviewee? As an admin, you can choose what information is shared with the employee. Please note that the options may differ based on your review cycle configurations. Keep in mind that nothing is shared until a manager releases the report to the specific reviewee. Regardless of what option you select, a manager will still need to release the report. The admin is simply selecting what is seen by the reviewee after the cycle has ended. Before making your selections, remember that reviewees will always have access to their self review and the manager's summary. Reviewees will never see answers to private questions. Share both the manager's review and their summary of reviews - Both the manager template and manager summary will be shared with the employee. Only share the manager's summary of reviews written about their direct report. The employee will only receive the manager summary. Share all Feedback with reviewers' names attached - All feedback with names attached will be shared with the reviewee. Share all feedback, but with peers' and direct reports' comments anonymized - All feedback will be shared, but any feedback given by a peer reviewer or by a direct report will not have a name associated with it. 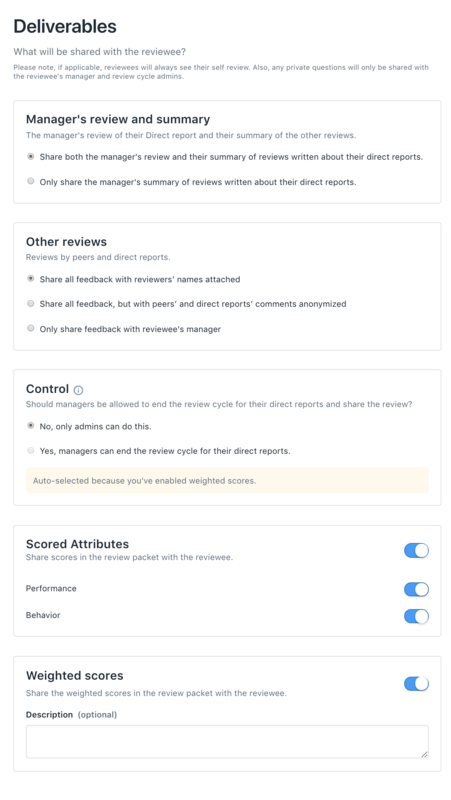 Only share feedback with the reviewee's manager - Direct Report and Peer Reviews will only be seen by the reviewee's manager and not ever shared with the reviewee. This section is where you determine if managers can end the review cycle early for their direct reports and share the review packet. Learn more here! No, only admins can do this. - Only admins can end the review cycle and allow people the share review feedback. Yes, managers can end the review cycle for their direct reports. - Managers can end the review cycle for their direct report and share the review packet at any time. At the top of the scored attributes section, you can turn the toggle off if you do not want to share any score attributes. If you want to share some but not other, simply turn off the toggles next to the attributes that you do not want reviewees to see. At the top of the weighted scores section, you can turn the toggle off if you do not want to share the score with the employee. If you choose to share the score, there is a box where you can add an optional description. In this box, we suggest putting description of how the score is calculated.